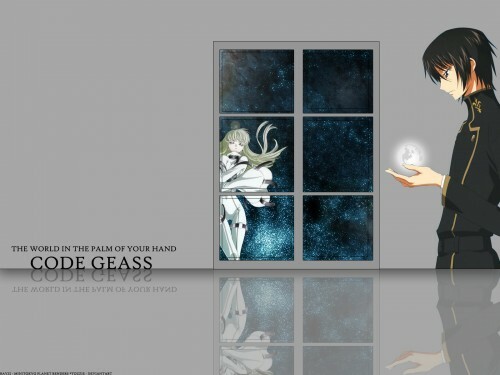 I did another code geass wall! I hope everyone likes it, I know it's a little plain, but once you put your icons on it, it looks a whole lot better. I've been getting into some Simpler-looking walls since that's what I seem to like, not too many brushes, or over filtered pieces. I think this took me around 3 hours. x_x I was trying not to keep it too simple, yet interesting. I don't know how many layers there were because there were WAY too many. I couldn't keep track of them all! Trying to be creative today was hard too, but once I started this, I wanted to finish it. All that isn't mine is the two renders, and the space scene behind C.C. Don't ask me why I put her there, I just thought she looked there. Her outfit reminds me of an astronaut anyways. :) I think this is the longest and hardest work I've ever done..... and it doesn't seem to look like it. :( But I hope you like it anyway!